The Nintendo DS (Japanese: ニンテンドーＤＳ Nintendō DS) is Nintendo's fifth series, seventh generation handheld game console. Released on November 21, 2004 in North America and Japan, and on March 11, 2005 in Europe, the Nintendo DS represented an experimental new era for Nintendo's game consoles. Having sold over 154 million units, the Nintendo DS family is currently Nintendo's best-selling hardware line, the best-selling portable console, and the second best-selling video game console overall, behind Sony's PlayStation 2. It was originally stated that a new system was being developed on November 13, 2003, though no details were announced. On January 20, 2004, the system was announced with the codename "Nintendo DS" - again, with minimal details. Later on, the codename was changed to "Nitro", but changed back to "DS" when the system was shown at E3 2004; the "Nitro" codename can still be seen in the product codes for all Nintendo DS-related items, such as the system's code itself: "NTR-001". The system shown at E3 was an older version of the system, which was much blockier than the final version, which was shown on July 28, 2004. On that date, the console's name was revealed to be "Nintendo DS". Nintendo chose to market the Nintendo DS as a separate device from the Game Boy Advance family and Nintendo GameCube, rather than as a successor to either. Despite this initial strategy, and perhaps because of Game Boy Advance backwards compatibility on the console itself, the DS did in fact serve as the replacement to the Game Boy Advance, and as of 2010, the end of the Game Boy line. Developers and gamers alike flocked to the console, which featured a significant difference from any previous gaming console: a second screen. This second screen, which doubled the screen real estate that developers had to work with for displaying menus and gameplay, was also touch-sensitive, and could be used to select items without pressing buttons or breaking up gameplay with menus. In addition to this, the more "standard" upgrades, such as the addition of a second speaker for true stereo sound and a microphone, were included with the console. The feature most enjoyed by gamers, however, is the DS's wireless connectivity capabilities, which allows gamers in close proximity to play with each other without the need for a physical cable, such as the one that the Game Boy line required, and for the first time, allowed players to compete around the world with each other through the Nintendo Wi-Fi Connection. This made the Nintendo DS the first handheld gaming system to support online play, and the first Nintendo console the support modern online functionality. Game Boy Advance games can be played on the system, as the DS's ARM7 coprocessor doubles as a GBA CPU in GBA mode. Players are able to set which screen the game should be played on in the firmware menu. Multiplayer functions for GBA games are not supported, as the system does not support the Game Boy Advance Link Cable and system's wireless standard is different from that of the wireless adapter. Just like the Game Boy Micro, the DS does not play Game Boy and Game Boy Color games and the cartridge slot does not accept those games, though it still contains these consoles' sound generation features for Game Boy Advance backwards-compatibility. The DSi and DSi XL omitted the coprocessor's GBA capabilities as well as the GBA game slot. Like previous handhelds, the Nintendo DS later received a revised form in the smaller and sleeker Nintendo DS Lite, which shares its overall design with the Wii, and features a stronger backlight that can be set on varying brightnesses, rather than the simple on-off light as seen on the original model. A second revision, the Nintendo DSi, features a redesign of the system's menus, removes the GBA slot in favor of a smaller design, and has the ability to play music, take pictures, and more. A second mode of the DSi, the Nintendo DSi XL, returns the system to the size of the original system, at the same time increasing its screen size to nearly double that of the DS and DS Lite. The Nintendo DS has twin 3-inch backlit color LCD screens. The lower display is touch sensitive and is operated with a stylus. The upper panel has stereo speakers on either side of the upper display. The lower screen's touch capability is utilized in most games, and many games utilize it as the primary, and sometimes only, method of control, as seen in Phantom Hourglass or Nintendogs. The system comes with built-in 802.11 wireless capabilities, allowing the system to link with other systems for multiplayer games and applications, such as the system's built-in PictoChat. The wireless also allows the system to connect to the Internet and take advantage of the Nintendo Wi-Fi Connection, Nintendo's online gaming service, allowing for Internet play of many of the Nintendo DS' games. The system features a microphone which can be used to pick up various sounds for whatever function the game developer chooses to use it for, be it voice-recognition (as seen in Nintendogs), voice chat (as seen in Metroid Prime Hunters), or many other potential applications. The DS also features an expansion slot (Slot 2) on the bottom, capable of playing Game Boy Advance games. Game Boy and Game Boy Color games are incompatible as the slot is not the right shape. The slot is also utilized for extra add-on hardware such as the Rumble Pak, which is used for certain games. The DSi and DSi XL lack the expansion port, so any games that use the second port for add-ons are incompatible. The Legend of Zelda: Phantom Hourglass and many other games make use of the DS internal clock. Certain events will take place at midnight according to the internal clock of the system. The Rumble Pak is the first official accessory to be released for the Nintendo DS, released in 2005 alongside Metroid Prime: Pinball. It is inserted into the system's expansion slot, and allows for supported titles to make use of its vibration features. A Nintendo DS Lite version of the Rumble Pak was later released. As the Nintendo DSi and Nintendo 3DS systems lack the expansion slot, the do not support this accessory, nor was a variant released. The Nintendo MP3 Player is a cartridge released exclusively in Europe in 2006. Although produced for Nintendo DS and Nintendo DS Lite, the cartridge is also compatible with all Game Boy Advance systems. The cartridge is able to play music through an SD card inserted into the cartridge, and features its own headphone port. The Nintendo DS Headset is an official headset produced for compatible games. Having a single speaker and a microphone, it was released alongside Pokémon Diamond and Pearl in 2007 and connects to both the system's headphone port and proprietary microphone port to allow voice chat in compatible games. The Nintendo DS Memory Expansion Pak is a cartridge released in 2007 which fits into the expansion port of the system to give the system more usable RAM, similar to the Nintendo 64 Expansion Pak. It adds 8MB of usable RAM to the system, as well as featuring a built-in memory management unit. The Memory Expansion Pak is only compatible with the Nintendo DS Browser, which it was packed with. A Nintendo DS Lite version of the Memory Expansion Pak was later produced, which is smaller and cast in clear plastic. Only released in Japan, the Nintendo DS Camera gives the system an internally-facing camera that allows the player to view their own face in certain games. The "Slide Controller" is a peripheral connecting to the expansion slot that uses the same technology as an optical mouse. Only compatible with Slide Adventure MAGKID, a Japan-only game and bundled with the device, the player slides the system across a surface to use it, like with a mouse. The Nintendo DS Digital TV Tuner is a device allowing the Nintendo DS to receive television signals that can be viewed on the device. Unlike most Nintendo DS add-ons, the TV Tuner is inserted into the Nintendo DS's standard cartridge slot rather than the expansion port. The peripheral was only released in Japan in 2007. The Pokéwalker is a pedometer themed after a Poké Ball and released in 2009 alongside Pokémon HeartGold and SoulSilver, the only compatible games. The Pokéwalker allows players to wirelessly transfer one of their Pokémon into the device, and it gains experience as the player walks. The Nintendo Wireless Keyboard is a keyboard that can be connected via a bluetooth signal to Nintendo DS hardware. The keyboard is only compatible with Learn with Pokémon: Typing Adventure, first released in Japan in 2011 and with which the keyboard was bundled at release. As the expansion port on the Nintendo DS is a Game Boy Advance cartridge slot, the Nintendo DS is also compatible with most Game Boy Advance accessories, including the e-Reader, Play-Yan cartridges, and Game Boy Advance Video. However, since the Nintendo DS uses wireless signals to communicate with other systems, it does not have a Link Cable port and is therefore incompatible with Game Boy Advance Link Cables and the Game Boy Advance Wireless Adapter. The Nintendo DS Lite (ニンテンドーDSライト, Nintendō Dīesu Raito) is a redesign of Nintendo's popular handheld gaming console. It improves on the original Nintendo DS in almost every way, and replaced the original upon its release. Nintendo originally announced it on January 26, 2006 before releasing it in Japan over a month later. It is roughly 42% smaller and 21% lighter, while retaining all of its features and screen size. As opposed to the original's on-or-off backlight, the DS Lite's backlight is always on, and has four adjustable brightness settings. The aesthetics have changed slightly; the system is shinier, the speakers take up less room, and several buttons (and the microphone) have been moved around. The stylus has an increased size over the original DS system's. Due to the system's decreased physical volume, the Game Boy Advance cartridges protrude from the system. To create a seamless surface, a filler cartridge is included, intended to be placed into the Game Boy Advance slot when no Game Boy Advance game is being played. The Nintendo DSi (ニンテンドーDSi, Nintendō Dīesuai) is the third version of the Nintendo DS handheld gaming system. It was announced during the Nintendo Conference 2008 on October 2, 2008 in Tokyo, Japan. 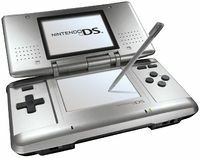 While it is a part of the DS series of handhelds, it has been stated that the DSi should be considered as a separate console next to the Nintendo DS Lite and the Wii within the United States. The DSi is somewhat larger in size, but is thinner in depth. It is likely that it is this decrease in size is likely what forced the removal of the expansion slot, as the bottom portion of the DSi is roughly 12mm, meaning that it is no longer backwards compatible with Game Boy Advance games, nor is it compatible with accessories that use the slot. It introduces several other new features over the Nintendo DS Lite. Game Boy Advance slot removed. Contains two 640x480 (0.3 megapixel) digital cameras, one on the outside face and one facing the user on the inside. Power switch replaced with a power button, with the added ability to simply reset the system back to the menu by lightly pressing the button. Has a new slot for SD cards for storing images and software. Built-in 256 MB of flash memory. An online shop, much like the Wii Shop Channel, that allows for the downloading of various DSi applications and games, such as a re-worked Brain Age. The points used for downloading content are system-unique, meaning that one cannot transfer points between the Wii and DSi. All DSi-specific software will have regional lockout and will not be compatible on a DS Lite. The Nintendo DSi XL (known as the Nintendo DSi LL in Japan) is a handheld game console produced by Nintendo and the fourth iteration of the Nintendo DS handheld gaming console, being the direct successor to the Nintendo DSi. Nintendo of Japan states that the DSi LL is not a successor to the DSi, but an alternate system and that both systems will sell alongside each other. As the DSi XL is only a minor hardware revision, the screen resolution was not changed despite the larger size. The reason for including the larger screens is mainly to make reading small text and playing games precisely easier. Another reason, according to Nintendo president Satoru Iwata, is "to offer a new play style, where those who are surrounding the game player can also join in one way or the other to the gameplay." The Japanese version launched in three colors: Wine Red, Dark Brown, and Natural White. No announcements have been made regarding color for any other region. The DSi XL, like every other DS, includes a stylus that fits into the unit. The DSi XL stylus is 96mm long, just 4mm longer than the stylus on the DSi. The XL also includes a 129.3mm-long pen-shaped stylus, which does not fit inside the console. In addition, for the first time in the DS line, two DS models will share a common AC adapter. The DSi XL will use the same AC adapter as the DSi. Despite the increased size of the displays, the battery in the DSi XL supposedly outlasts that of the DSi. Nintendo claims 13-17 hours of runtime on the lowest brightness setting, compared to 9-14 hours on the DSi. On the highest brightness setting, the DSi XL supposedly lasts 4-5 hours, one hour longer than the time range for the DSi. Preloaded on the internal memory: the DSi Browser, Flipnote Studio, Brain Age Express: Arts & Letters, Brain Age Express: Math, and Meikyou Kokugo Rakubiki Jiten, a dictionary program. Contents for the North American and European releases have yet to be confirmed. As a DSi, the XL can play DS cartridges, including those designed only for DSi and those enhanced for DSi. It is also capable of downloading and playing DSiWare. Like the DSi, there is no slot for Game Boy Advance cartridges. As of September 2008, combined sales of Nintendo DS and Nintendo DS Lite have reached more than 84 million units worldwide. By the end of January 2010, that number increased to over 125 million units sold worldwide, making it Nintendo's best selling console of all time. ↑ Hardware and Software Sales Units. Nintendo. Retrieved October 29, 2016. ↑ Nintendo Reveals "Third Pillar"!. Nintendo World Report (January 20, 2004). Retrieved October 29, 2016. ↑ "Consolidated Financial Highlights" 11. Nintendo (2008-10-30). Retrieved on 2009-01-07. ↑ "IGN.com" (2010-01-28). retrieved on 2010-05-12. This page was last edited on 28 October 2018, at 23:27.